pool. It is recommended to people who love the quiet of midsize hotels, and want the comfort of being near the sea. 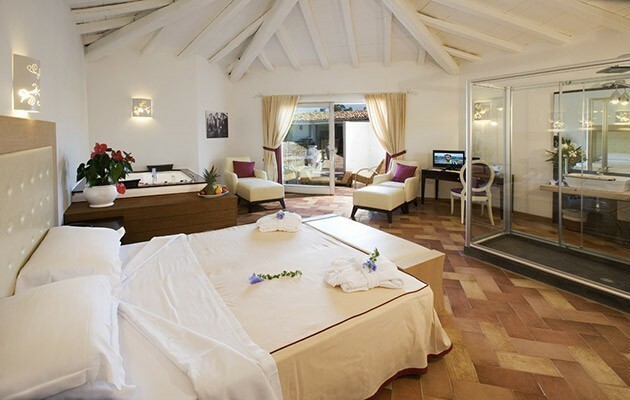 The Villas Resort is located in Costa Rei on the south eastern coast of Sardinia at around 70 km from Cagliari. The Villas Resort is surrounded by a wild nature and just a few steps from the beach of Costa Rei. The architecture of the Villas Resort is typically Mediterranean and gives rise to shapes and colors that complement each other superbly, without creating any contrast to the landscape. The hotel itself is elegant and refined, and is ideal for a wellness-vacation or a relaxing holiday for couples, singles, and families. The rooms are also suitable for all different needs one might have; there are plenty of services for the hotel's younger guests, various activities for adults, and sports facilities in all major sports. The hotel also features a beautiful outdoor pool, a sunbathing terrace. The rooms are double, triple or quadruple and are equipped with bathroom with hair dryer, complimentary toiletries, air conditioning, satellite TV, minibar, safety box, equipped patio or balcony, beach service included from the 3rd row with 2 loungers and 1 umbrella. They are furnished in a modern and sober, elegant style. Classic (approx. 20-25 sq.m.) – they have a patio or a balcony. The Classic rooms have a double room and can host an additional 3rd or 4th bed for children (smaller size). The bathroom has a shower. De Luxe (approx. 25-30 sq.m.) – double rooms with the possibility, on request, to add a 3rd or 4th bed for children (smaller size). The De Luxe rooms are located on the 1st floor in the main building and have a balcony with sea view. The bathroom has a shower and prestige complimentary toiletries. Suite (approx. 35-40 sq.m.) – are located on the garden level in a more quiet area. They have a double bedroom and a separate living room with a sofa bed. They face a patio with a whirlpool (use with surcharge). The bathroom has a shower and prestige complimentary toiletries. Family Suite (approx. 50 sq.m.) – are located on the ground or 1st floor, these exclusive, spacious suite have a double bedroom, another twin or single room and large living room. They face a patio/balcony with whirlpool (use with surcharge). The bathroom has a shower and a prestige complimentary toiletries (some suite have 2 bathrooms). Villas Resort is 500 m away from a beautiful sandy beach with crystal clear water, ideal also for children. An area of the beach is dedicated to Villas guests and equipped with different rows of sun beds and umbrellas. The beach service is included from the 3rd row with 2 loungers and 1 umbrella. The beach is reachable on foot along a unpaved road (approx. 10 minutes walk) or comfortable with the shuttle of the hotel. Surrounded by the sweet fragrance of juniper, guests can deep into the wellness atmosphere and fully relax body and mind. You can choose among several massages and different beauty treatments or just relax in the Turkish bath, whirlpool or under the emotional shower. Villas Resort is pleased to welcome families with children, to which it offers a wide range of personalized services that will make your stay easier and funnier. A Nursey service offers specific products for children and assistance to mothers during meals, for babies from 0 to 2 years. For children aged 4 to 12 years, the hotel offers a Mini Club service, a park with slides and swings, baby dance, sports tournaments, cultural and recreational activities. The Mini Club is available from around June, 8th to September, 6th every day from 09.30 to 12.30 and from 15.30 to 23.00 including in-between snacks and dinner supervised by the staff. At the Villas Restaurant an American breakfast buffet is served (07h30 to 10h00), for lunch from 12.30 to 14h15 it offers a "light lunch" with a buffet, while for dinner you can enjoy a Grand International Buffet with a selection of appetizers, salads, fruit, hot firsts and second courses, desserts open from 19h00 to 21h00. All drinks are excluded. The American Bar is open daily from 10h00 to 01h00, with piano bar in the evening and offers a variety of snacks, sandwiches, ice cream, drinks and cocktails. Close to the beach is the Beach Bar open from 10h00 to 19h00. The opening hours and days of the restaurants are at Management discretion and varies according to weather forecast. No drinks are included during the meals. At disposal for the guests of the Villas Resort are: soccer field (calcetto) and tennis court (night lighting against charge) for group tennis lessons, bocce, beach volleyball, fitness mini gym, morning muscle toning lesson, jogging, aerobics, water aerobic every day, soccer/tennis/table tennis tournaments. With costs: tennis court, private tennis lessons, diving (nearby), rental of boats and rafts (nearby), nautical excursions, laser, hobbyecat, windsurfing, canoes and pedal boats, water ski, mono-ski, wake-boarding, banana boat; Minigolf field of 18 holes at 600 m, horse riding at 2 km. VILLAS “SILVER” for € 300,00 per room per week, daily newspaper, reserved table at the restaurant (as long as table availability), beach towels in the room on the arrival day, 1 umbrella and 2 loungers reserved in the 2th row at the beach. VILLAS “GOLD” for € 500,00 per room per week, late check-out until the 2.00 pm, daily newspaper, reserved table at the restaurant (as long as table availability), beach towels in the room on the arrival day, 1 umbrella and 2 loungers reserved in the 1st row at the beach. For all other clients, who do not wish to book a Villas Card, there will be 1 umbrella and 2 loungers starting from the 3rd row at the beach. Following services are available at the Villas Resort: welcoming and professional staff 24/24 hours; sale of newspaper and tobacco; room-service with surcharge; TV room; turndown service with surcharge; porter service; laundry service (surcharge); piano bar; swimming pool with relaxing area; parking (unattended); beach towels available FOC with change every second day; shuttle service to the beach; internet Wi-Fi connection in the common areas free of charge; baby-sitting (on request and surcharge); bike rental. The city tax is € 1.50 per person per overnight, to be paid on-site. 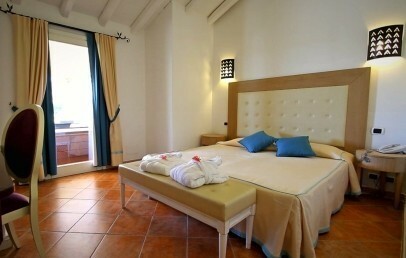 Double rooms furnished in a sober and elegant style. They face a patio or balcony, equipped with air conditioning, Tv Sat, minibar, safe, Wi-Fi. The bathroom has a shower and hairdryer. Comfortable and modern double rooms with a satellite TV, air conditioning, minibar, safe and Wi-Fi connection. The bathroom has a shower, a hair dryer, bathrobes, prestige courtesy set. 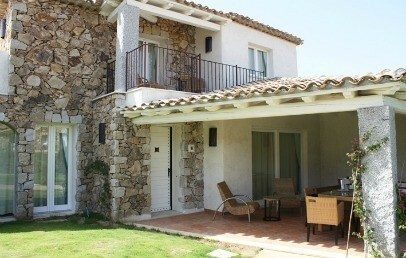 They are located on the first floor of the main building and have a balcony with view towards the sea. 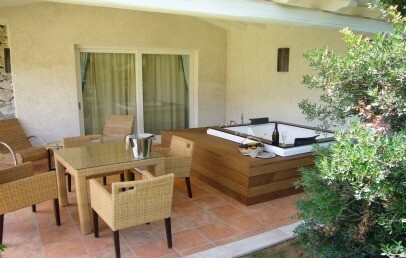 Located in a private area in the garden, they consist of a double room and large living room with a sofa bed. The bathroom has a shower, bathrobes, a hair dryer , bathrobes, prestige courtesy set. They face the patio with whirlpool (use with surcharge). 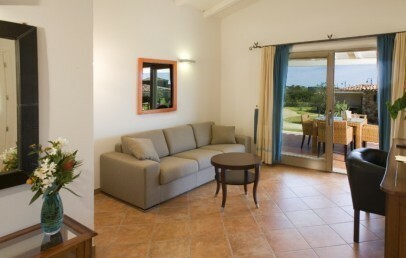 The Family Suites are located in a private area in the garden or on the 1st floor. These exclusive Suites can be defined as mini-apartment, they have a double bedroom and a twin or single bedroom and a lovely living area. The bathroom has a shower, a hair dryer, bathrobes and prestige courtesy set (some Suite have 2 bathrooms). They face a patio or balcony with a whirlpool (use with surcharge).